The Wednesday Walk scheduled for the last week in May of this year was actually a four day event: more of a mid-week meet in the Wicklow hills, from Tuesday 29th to Friday 1st June. Some members even made it into a full week's stay and included trips to the Burren in Co. Clare and to the Neolithic monuments of the Boyne Valley in Co. Louth. The meet proper got off to a bit of a shaky start when it was discovered that the pub designated as the rendezvous point (Kavanagh's of Roundwood) was not open so the assembled party had to make its way to the bar of the Royal Hotel in Glendalough where some sustenance was taken. A visit to the monastic settlement and its interpretive centre was followed by a short walk over the nose of Camaderry mountain to take in the views over the two lochs which give this valley its name. And then it was on, by car, to the Glenmalure Lodge, which was to be our base for the three days. At Glenmalure, the group was joined by a number of Irish friends - with whom several LMC members have shared Scottish winter trips over the past decade or more - and a pleasant evening was spent in the bar. The plan for Wednesday was to make an ascent of Lugnaquilla, one of the only two Munros in Ireland that lie outside of Co. Kerry. From Glenmalure, Lug hides itself behind its many outlying ridges and tops and there are several route options. We had decided to make our initial approach via an old zig-zag track that was built in the 19th century to bring anglers to Kelly's Lough in an area known as Carawaystick and from there up to the Clohernagh ridge and then onto the large plateau that forms the summit of Lug. Mary Ledwick, Pat and Ian Aitchison, Dave Fisher, Roger Finn, Graham Welsh and Jim Cunningham all opted for this route and they were joined by Niall Rice, Tom Fenlon, Paddy O'Leary, Jimmy Leonard and Liam � Cl�irigh from the home team. Meanwhile, Derek Miller and Brian Guilfoyle accompanied by Michael Slevin decided to do a section of the Wicklow Way, a long trekking route which passes through Glenmalure. The zig-zag brought us up the steep side of the glen without too much effort but as we moved out onto the open mountain we were hemmed in by thick mist. Tom Fenlon, a pipe-smoking asthmatic who only has one gear - and that's overdrive - vanished into the fog and was not seen again until he appeared in the bar later that evening. In true LMC style, the rest of the visitors ignored their leader (Liam) and followed other members of the home side who offered themselves as false prophets with the result that everyone bypassed Kelly's Lough entirely in the poor visibility and were only rejoined with the leader because he waited for them on the ridge where he was heard to grumble that it would have been easier to be minding mice at a busy crossroads. 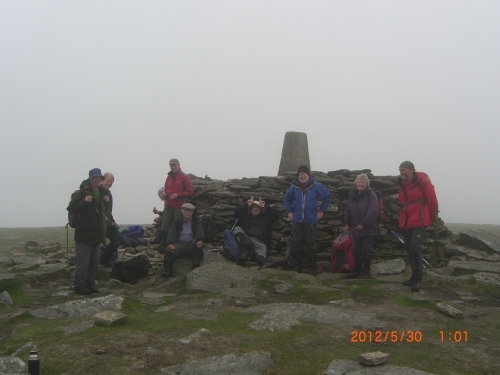 As we reached the summit, however, the mist lifted, and we had a magnificent three-hundred-and-sixty degree view, southwards to the Blackstairs mountains in Wexford, westward out over the plains of Kildare with the expanse of the Wicklow hills rolling northwards and the Irish Sea to the east. We made our descent route through Fraughan Rock Glen and under the Barravore cliffs to ford the Avonbeg river where we had positioned a car earlier in the day. All in all, the walk took about six hours. The English, the English, the English are best: I wouldn't give tuppence for all of the rest! The rottenest bits of these islands of ours, We've left in the hands of three unfriendly powers, Examine the Irishman, Welshman or Scot, you'll find he's a stinker or not. The Irishman, now, our contempt is beneath, He sleeps in his boots and he lies in his teeth, He blows up policemen (or so I have heard), And blames it on Cromwell and William the Third. The English are noble, the English are nice, And worth any other at double the price! Despite this crude provocation, the home side remained good-humoured and even offered prayers for their misguided guests before all retired to the bar where an impromptu traditional session by local musicians kept everyone in good spirits for the remainder of the night. Thursday was what the Irish call a �soft' day: cloud down around the ankles and a spray of fine rain that might be good for grass growth but which soaks you to the skin. A relatively short ridge walk to the top of Crohanmoira saw us back in the hotel for a late lunch and the two sides took their farewells of each other as the Irish headed for their homes to vote in a referendum on the EU Fiscal Treaty while the English ensconced themselves in the bar. It has been alleged- and it must be stressed that this may simply be a libellous rumour - that, on the Friday morning, some serious maths was required to sort out the drinks bill for room 11 where Roger Finn, Brian Guilfoyle and Jim Cunningham were staying. Editor's note: Kelly's Loch is easily missed. About the size Loch Lomond it is an area beset with mists and the loch itself rarely sighted. Apparently our visit coincided with a period of abnormally low tides and, in-spite of pin point navigation, a sighting proved elusive.